Many popular floor saws turn counter-clockwise, also referred to as Up-Cut Rotation. Up-Cut Rotation pushes the concrete to the surface as it cuts and then the skid plate helps to trowel the edge smooth. Technically, this method disturbs the aggregate by nudging it upwards, but smooths it over with the skid as you continue. As a result, the cuts look perfect upon completion, but the edges have been disturbed by the up-cut process. Some of these cuts fail after they’ve cured with heavy traffic because of the disturbance, but the contractor gets paid at the time the job is done, not at the time the concrete cures. It’s something you want to keep in mind. A Down Cut rotates opposite of an Up-Cut and is preferred because it does not kick up the aggregate and loosen the joint. See in the picture below how the top edges of the joint are no longer straight? 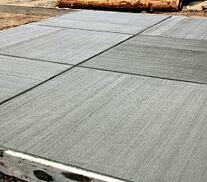 – that is a result of Up-Cut Rotation pushing the aggregate up and loosening the concrete around the joint. WHY CAN'T I USE A REGULAR DOWN-CUT SAW TO CUT SOFT CONCRETE? It takes a very precise saw to cut green concrete cleanly. Most conventional saws allow too much movement both laterally and vertically. Larger diameter blades have more chance of wobble which can also damage the cut. A saw like the SG10 uses a 7’ to 10” blade maximum in order to prevent the occurrence of a wobble that will damage the cut. Two other important keys to a clean cut in your green concrete are speed and control. Without the right piece of equipment, that has been designed to do all of those things at once, there are too many external variables that can negatively impact your cut. That’s why it is so important to invest in the right saw. WHAT MAKES THE SG10 GREAT FOR CUTTING GREEN CONCRETE? Vertical Travel- Notice the distance of vertical travel (blade raising and lowering) is minimal on the SG10 as compared with a conventional flat saw. The lower profile and shorter distance of travel keeps the weight forward and down on the blade. This helps control side to side movement which on its own, is enough to spall a joint. Wheel Tracking– The SG10 has four of the same size wheels in parallel; both side to side and front to back. This helps keep a straight true cutting path. 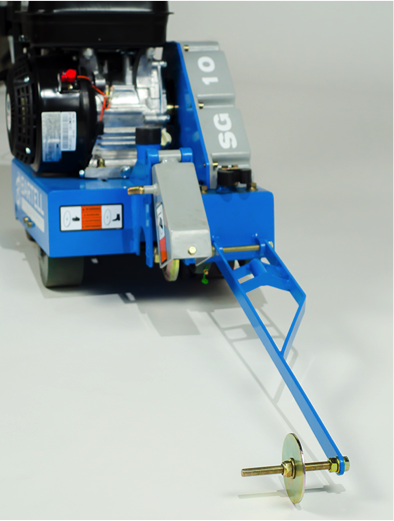 Blade Position– The SG10 has a center mounted blade, where most saws use side mounted blades. The side mounted blade acts as a point of resistance and makes the saw want to steer in that same direction. This makes it difficult to cut a straight line- which is critical and frustrating. A saw with a center mounted blade naturally wants to cut straight. Debris - A side mounted blade will throw the debris under the outboard rear wheel and can make the saw teeter over the debris. The teetering can disturb the joint. The SG10 throws the debris back through the centre, between the wheels, leaving a smooth surface for the wheels to ride on. Blade Speed – Most other 10” saws will turn at between 3,000 and 3,600 rpm. The SG10 spins at 6,000 rpm. The higher speed allows the blade to slice through the concrete and aggregate without disturbing it like a low rpm saw would. Tracking Control – Just as in the front, the SG10 has a rear pointer with a narrow disc that drops down in to the existing cut. This feature keeps the saw tracking straight and true. If you want to make sure that you’re cutting a joint that is straight and strong, you need to make sure you have the right piece of equipment that can cut at a high speed, with excellent control, and won’t bring up aggregate that will ultimately cause these cuts to fail. If you keep all of these important tips in mind, you’ll end up with pristine cut that does what it’s made to do and stand the test of wear and time.